Launch day for Gail McGarva’s lerret Littlesea. Those Boat Building Academy folks certainly know how to organise a party! Gail McGarva’s lerret named Littlesea was launched at Lyme with all due ceremony on the 31st July, during the town’s Lifeboat Fortnight. Vera, the last seaworthy original lerret built in 1923 and the model for the new boat, was in attendance, along with two local racing gigs and what from the photos looks like half the town. The lerret is a boat wholly native to Lyme Bay going back to 1682, and is a beautiful beamy double-ended clinker vessel of 17ft, built in elm on oak. Designed to be launched and landed from the area’s steeply-shelving stony beaches, lerrets have remained virtually unchanged from their beginning. 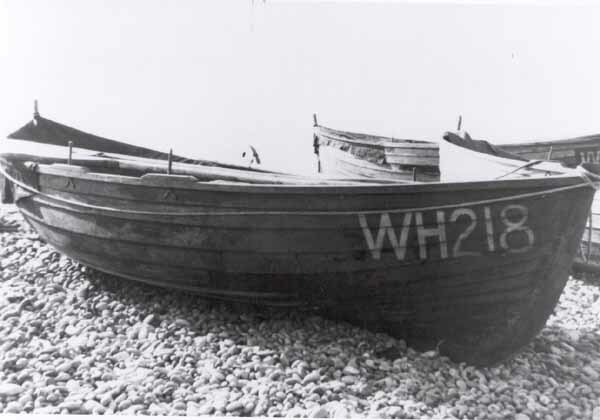 Although primarily used for mackerel fishing, lerrets also earned such respect for their seaworthiness that in the early 19th century the newly formed RNLI adopted two for service as lifeboats. Archive material recounting their stories of saving lives at sea is said to be extensive and quite remarkable, and Littlesea was launched during Lifeboat Fortnight in order to celebrate the connection. As an earlier post about the project explained, Gail was awarded a scholarship to build a lerret from the Queen Elizabeth Scholarship Trust, funded by the Royal Warrant Holders Association. Gail built this boat by eye – that is, without designer drawings – under the mentorship of Roy Gollop,one of the last remaining boatbuilders in Dorset with this particular skill. 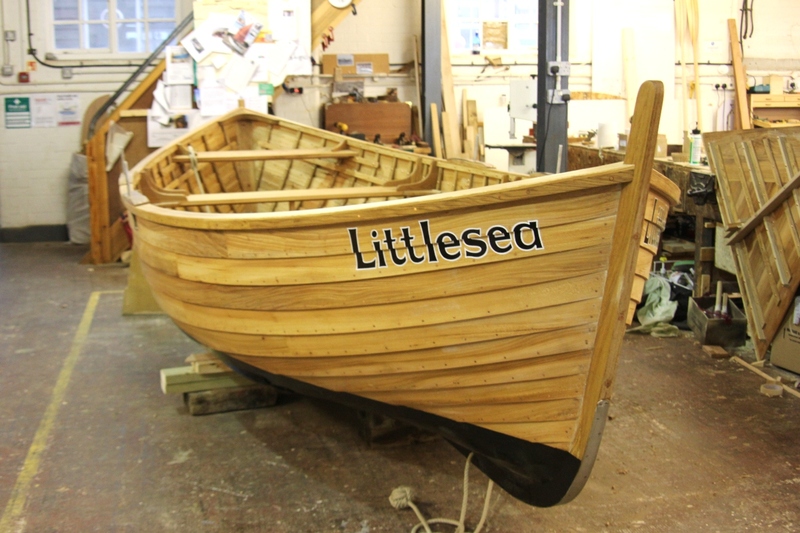 Littlesea is to be actively used as a training boat to enable young people to gain confidence at sea,develop their rowing skills and work together as team. 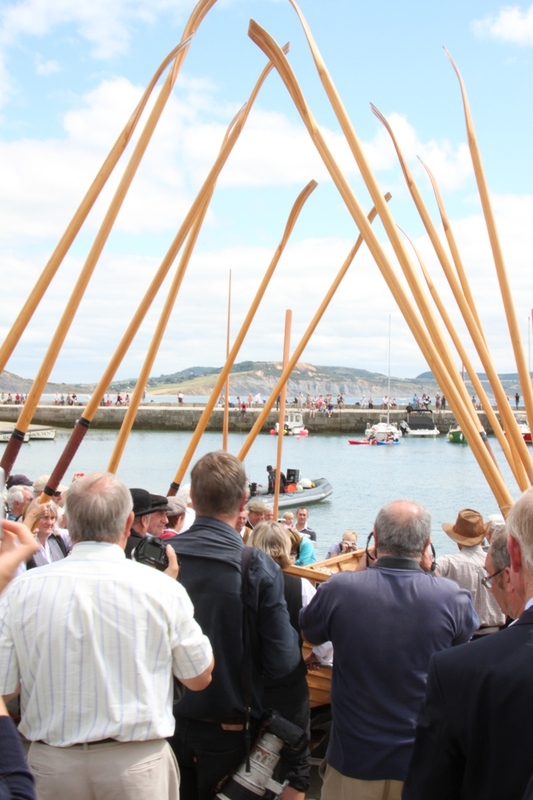 The new lerret and procession, complete with an oar salute from Lyme Regis Gig Club, journeyed from the Boat Building Academy,which housed the building of the boat, to the harbour slipway. The boat bearers and rowers were dressed in Sunday best of white shirts and waistcoats in a deliberate echo of boatyard launches of the past, and were accompanied by a brass band. Gail gave a speech and presented Roy with a traditional yard foreman’s bowler hat in appreciation of his guidance and support, and the new lerret was named by Queen Elizabeth Scholarship Trust president William Gunn. 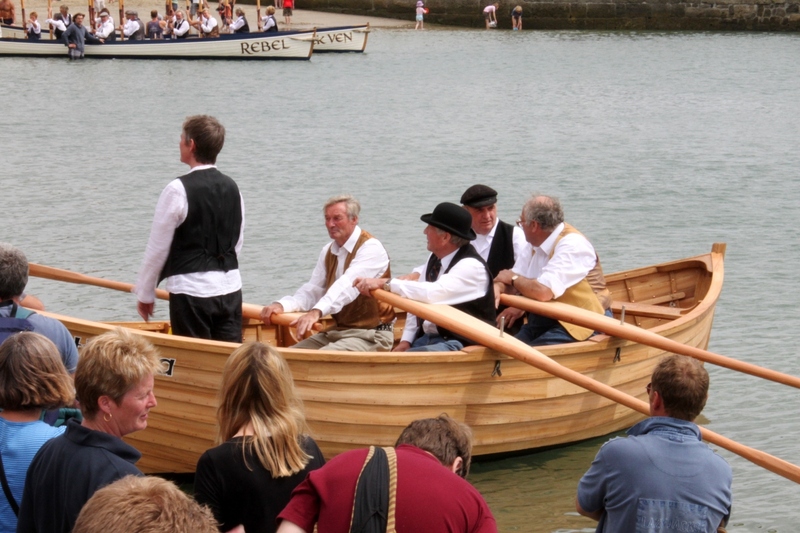 The boat was blessed, a local songwriter performed a song for the occasion, and the boat was then carried through an archway of Cornish pilot gig oars, scattered with sea salt for safe passage at sea and launched behind the protective arm of the harbour’s sea wall, known as the Cobb. Littlesea was then guided out to sea by the RNLI lifeboat The Pearl of Dorset, accompanied by Vera and escorted by Lyme’s two Cornish pilot gigs,which were also build by Gail in 2008 and 2009. Littlesea is the local name for the Fleet behind Chesil Beach, as Gail learned from 90-year old Majorie Ireland. Marjorie’s family worked the lerrets along Dorset’s shores. There are many references to lerrets in Basil Greenhill’s Working boats of Britain: their shape and purpose and also a nice description, a drawing and photos in his Chatham directory of inshore craft .